The Polyhedrals Are Coming! The Polyhedrals Are Coming! Ok so our international followers probably won’t get the humor in that title, and sadly neither will a large portion of our American followers. The good news is that the polyhedrals are coming! 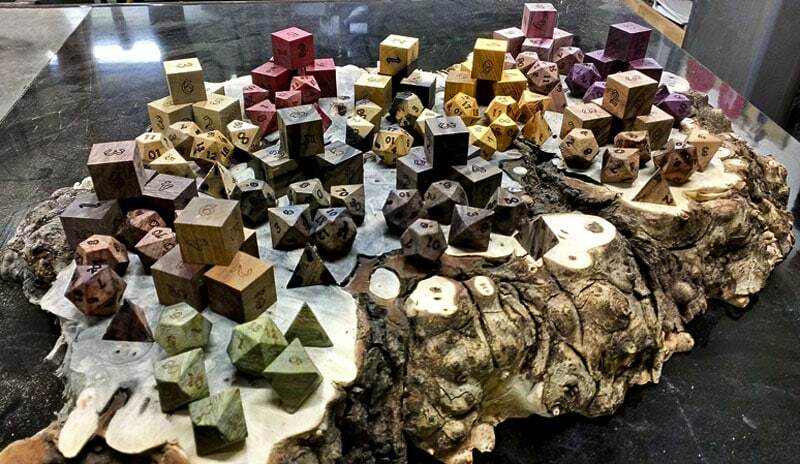 Thanks to our Polyhedral Backers from the first Kickstarter, we now have the ability to make polyhedral dice from exotic hardwoods! We will be launching a brand spanking new Kickstarter Project in due time to bring these awesome dice to full production status. Sadly that Kickstarter Project will probably not come to an end in time to ensure shipping for the Holiday Season. But rest assured there is away to get those presents yall keep asking for! There are 2 ways you can get your hands on an Artisan Dice Polyhedral Set in time for good old Saint Nick. First I’m going to give away 3 sets of polyhedral dice to 3 lucky Facebook Fans once we hit 1000 followers. All you have to do is like us on Facebook and share this post with all your friends! Once we hit 1000 Followers I will choose 3 folks that have shared this post on their walls and liked our Facebook Page, at random to receive a free set of polyhedral dice made from one of the exotic woods listed below. I’ll be adding photos and description of the Zircote, Curly Koa, Cocobolo, and Bois d’Arc shortly. You can see all of these woods with the exception of Cocobolo in the above image. From Left to right the woods are Honduran Rosewood in back Lignum Viate in front, Ancient Kauri and Red Heart in back, Zircote in front, Black and White Ebony in Back, East Indian Rosewood in front, Bois D’ Arc In back, Curly Koa in front, and in the way back there is Aromatic Cedar, and Purple Heart. And before you as Ancient Kauri is NOT available at this time, it will be when we launch the Kickstarter. please note that all the above dice are pictured raw and unfinished. Their coloration will become deeper and their grain more pronounced after they are clear coated. Once all 48 sets are gone the check out box below will disappear. So if you can’t find the add to cart button, that would be why. 8 reviews for The Polyhedrals Are Coming! The Polyhedrals Are Coming! d10 if by land, d20 if by sea? yup we will have all the rosewoods once the kickstarter goes live. for the holiday dice we’ll only have what’s listed here. and yes brazilian rosewood is fraking beautiful. Have you considered using any hard materials yet? I know that I’d be willing to pay a premium price for carved marble, jade, bone or horn. yes we are looking in to doing bone and antler dice. we will probably not be making stone dice any time soon. that would require a completely different skill set and tools to work with. Please do Bone Dice, I love playing Necromancers and it would be beyond Pro. the problme we are having is finding a bone that is actually solid all the way through. can’t make dice from marrow. Looking at the pictures they look much larger than the standard 16mm dice, what scale are they actually at? the d20 and the d6’s are roughly 3/4″ from face to face. the rest of the dice are scaled to match. they are slightly larger that a standard d20 set. What dice/how many come in a set for the $100.00? Any chance in the future of being able to get a set of percentile dice on their own and eight sided D4’s?